Have you done a REAPP workshop? Then you must be familiar with the Communication Cycle. Some time during the workshop the facilitators laid out a mat on the floor and showed you how to properly structure an otherwise heated debate. Like: where to go for the holidays? or: should I take this new job? or: who is responsible to fold the laundry? Now this Communication Cycle is available as an app on the App store for iPad. 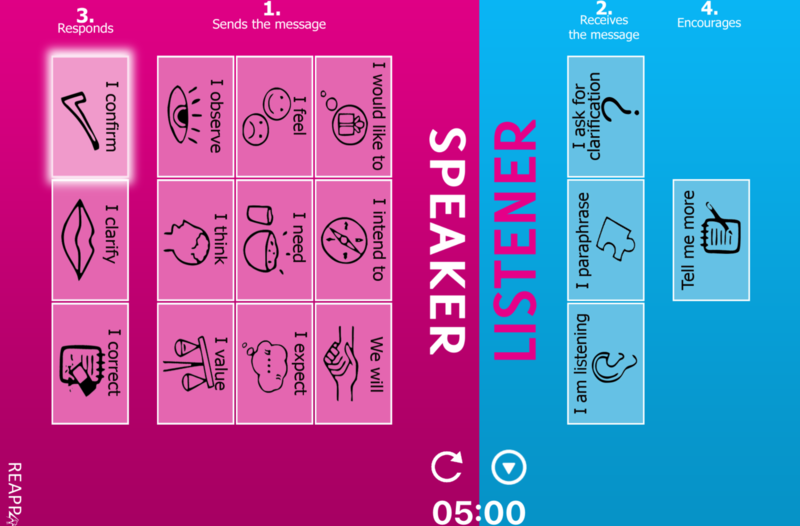 The REAPP app is a great tool for developing your communication skills. Simply state your topic and start expressing yourself while indicating with your finger what you are saying. When clicking a box, it will illuminate and give suggestions at the bottom of the screen. Click “I am listening” when listening and move to “I paraphrase” when it’s time to assure the speaker that you understand what he/she is saying. To fully understand the communication cycle, we encourage you to attend one of our workshops. For more info visit http://reapp.org.